Source: Our Best Bites website, linked below. My neighbor sent me the link. Thanks a lot, Jen! Yield: 5-6 dozen regular cookies, or 2.5 – 3 sandwiches. Unless you like the raw dough, then make that 2 dozen sandwiches. Oh joy, oh rapture!! The admittedly un-sophisticated crowd I asked for opinions of this cookie gave it an average score of 12 out of 10. (Most of them were younger than 12 years old.) I have to agree, though; they are seriously amazing. My friend sent me this link, which is where I found the recipe. You can also find a link to Our Best Bites on my right sidebar. I’ll give you the recipe here, too, just for kicks. Second, I will admit that I used dark brown sugar in this dough, but only because I had it on hand and had no idea what else to do with it. I really don’t think it makes a huge difference though. Third, I was too lazy to roll the dough into cute little balls and cover them in sugar. 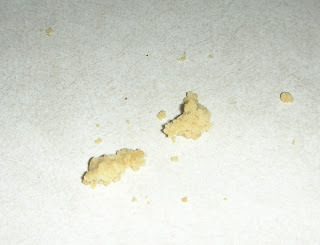 I just plopped the dough on the cookie sheet and used the fork to do the cute little cross-hatch pattern that is the signature of peanut butter cookies. I actually wish I had at least rolled them into balls first. I’m sure they would have turned out cuter, closer to actually round, and more professional looking. Mine looked okay, not as bad as a 5 year old making them, but maybe a 10 year old. 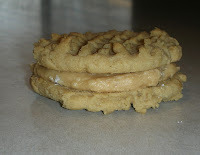 For example, this cookie turned out a little screwy. What can you do with a cookie like that? The Best Bites author says she made hers small, and baked them at 375 degrees for 6 minutes. They must have been really small! Mine were pretty small, and I had to give them 8 minutes to get them done enough for my liking. I agree with her, though, that it is a huge shot of sugar all at once, and a smaller cookie is probably a good idea. On to the frosting. This recipe makes enough frosting to feed a small army. Half the frosting would probably have been enough. As you know, I’m not big on measuring things for my frosting. I did measure everything except the powdered sugar this time. I put the sugar in last, adding and stirring until it’s a good consistency. I don’t think mine had 4 cups in it, though. If I had to guess, I would say it was closer to 2 1/2 or 3 cups. I may have to make oreo cookies now, to get rid of the extra frosting! I’ve been dreaming about these ever since tasting them at your house, crazy I know. We are making these tonight! Not crazy at all. I dream about them all the time! Especially the frosting… yum! Suze is my friends mom, Keilee and Micah!! How funny!! Well This looks soooo good cant wait for my dad to make them! !